Cement uses raw materials that cover calcium, silicon, iron and aluminum. Such raw materials are limestone, clay and sand. Limestone is for calcium. It is combined with much smaller proportions of sand and clay. Sand & clay fulfill the need of silicon, iron and aluminum. 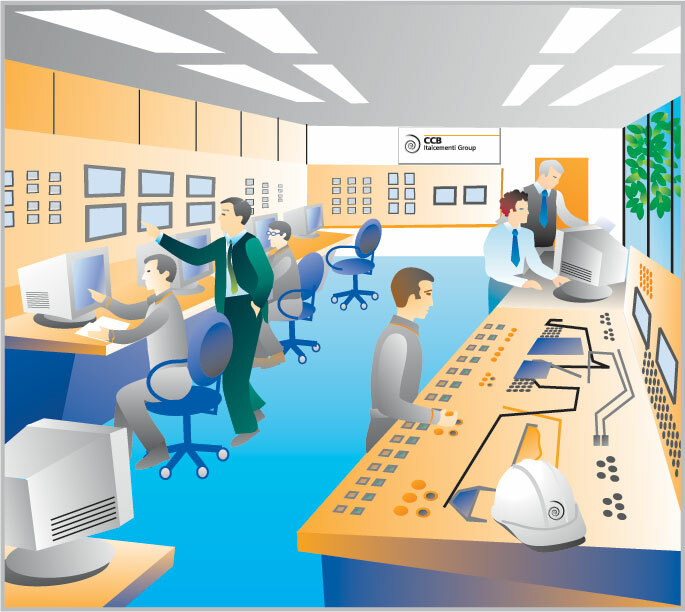 Generally cement plants are fixed where the quarry of limestone is near bye. 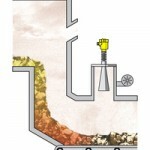 This saves the extra fuel cost and makes cement somehow economical. Raw materials are extracted from the quarry and by means of conveyor belt material is transported to the cement plant. 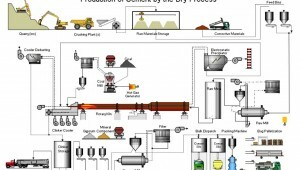 There are also various other raw materials used for cement manufacturing. For example shale, fly ash, mill scale and bauxite. These raw materials are directly brought from other sources because of small requirements. The raw materials from quarry are now routed in plant laboratory where, they are analyzed and proper proportioning of limestone and clay are making possible before the beginning of grinding. Generally, limestone is 80% and remaining 20% is the clay. Now cement plant grind the raw mix with the help of heavy wheel type rollers and rotating table. Rotating table rotates continuously under the roller and brought the raw mix in contact with the roller. Roller crushes the material to a fine powder and finishes the job. 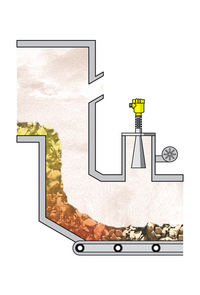 Raw mix is stored in a pre-homogenization pile after grinding raw mix to fine powder. After final grinding, the material is ready to face the pre-heating chamber. Pre-heater chamber consists of series of vertical cyclone from where the raw material passes before facing the kiln. Pre-heating chamber utilizes the emitting hot gases from kiln. 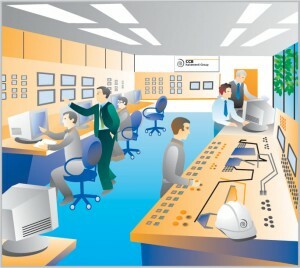 Pre-heating of the material saves the energy and make plant environmental friendly. 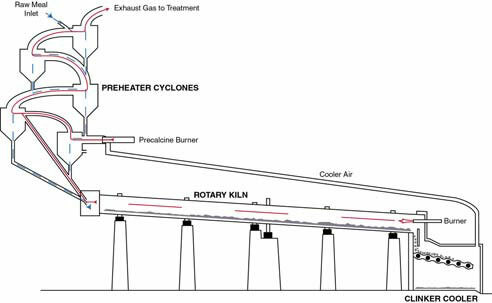 Kiln is a huge rotating furnace also called as the heart of cement making process. Here, raw material is heated up to 1450 ⁰C. This temperature begins a chemical reaction so called decarbonation. In this reaction material (like limestone) releases the carbon dioxide. High temperature of kiln makes slurry of the material. The series of chemical reactions between calcium and silicon dioxide compounds form the primary constituents of cement i.e., calcium silicate. 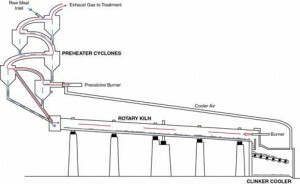 Kiln is heating up from the exit side by the use of natural gas and coal. When material reaches the lower part of the kiln, it forms the shape of clinker. After passing out from the kiln, clinkers are cooled by mean of forced air. 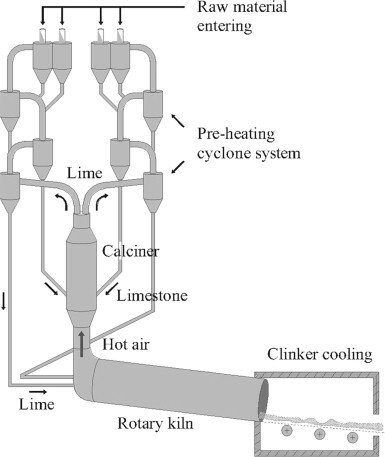 Clinker released the absorb heat and cool down to lower temperature. 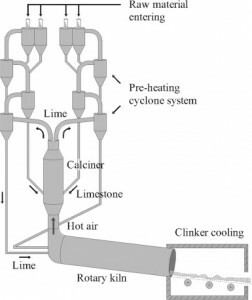 Released heat by clinker is reused by recirculating it back to the kiln. This too saves energy. Final process of 5th phase is the final grinding. There is a horizontal filled with steel balls. Clinker reach in this rotating drum after cooling. Here, steel balls tumble and crush the clinker into a very fine powder. This fine powder is considered as cement. 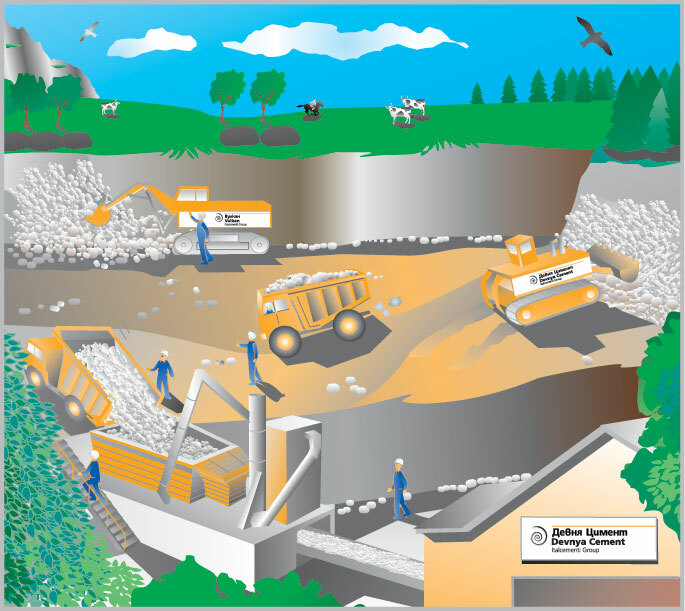 During grinding gypsum is also added to the mix in small percentage that controls the setting of cement. 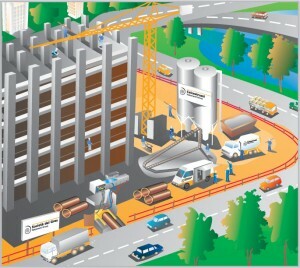 Material is directly conveyed to the silos (silos are the large storage tanks of cement) from the grinding mills. Further, it is packed to about 20-40 kg bags. Only a small percent of cement is packed in the bags only for those customers whom need is very small. The remaining cement is shipped in bulk quantities by mean of trucks, rails or ships. 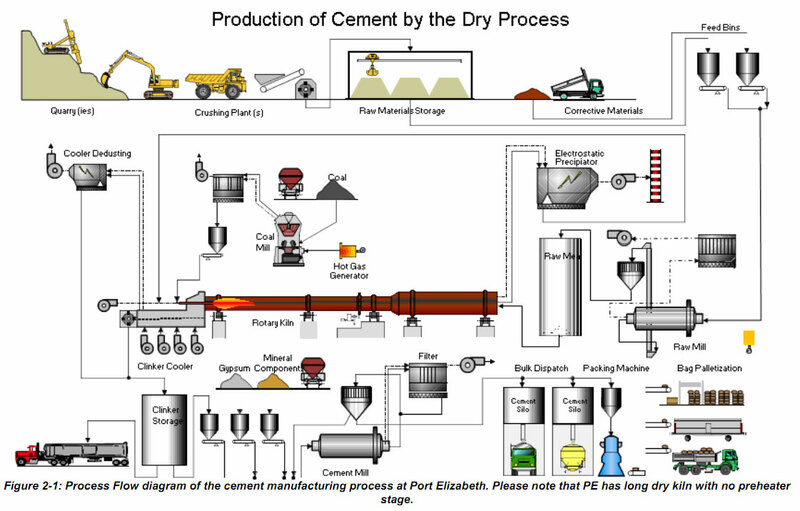 After explaining the complete process of cement making, flow chart would be like that. flow chart present the summary of whole process as shown below. link or newsletter service. Do you’ve any? Please let me recognise in order that I may just subscribe. Thanks. Widely used in highways, utilities, construction and other industries washing, grading, cleaning, as well as fine-grained and coarse-grained materials processing and other operations, the construction and gravel roads are particularly suitable. We feel proud to present ourselves as the well renowned importer and exporter of different Optimum Quality Engineering Equipments. Each and every product, forming part of our exquisite collection, has to go through different stringent quality checks so as to ensure that only finest quality product ultimately reaches the market.